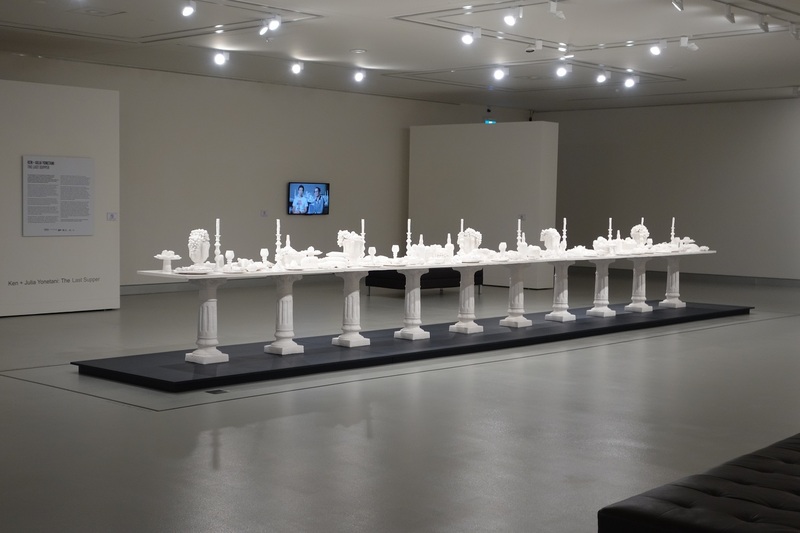 The Last Supper, installation view Hawkesbury Regional Gallery, 2015. 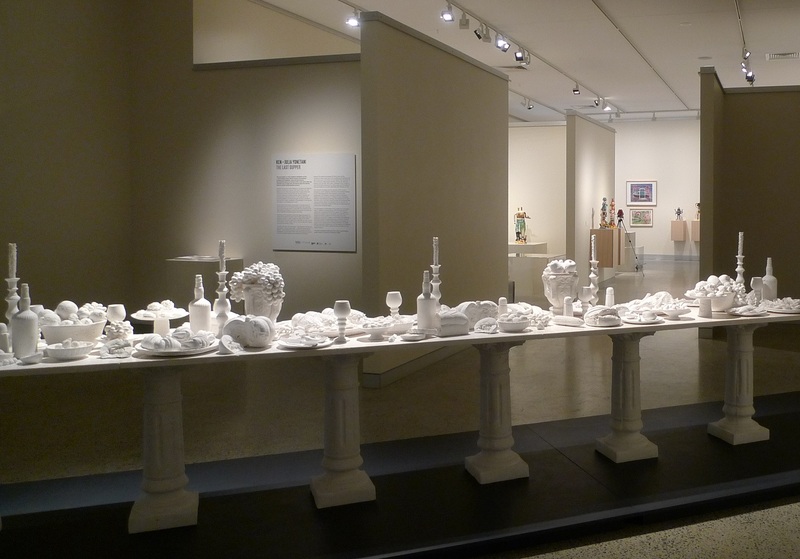 The Last Supper, installation view Tweed Regional Gallery, 2015. The Last Supper is a sculptural installation by Ken + Julia Yonetani, commissioned by Hazelhurst Regional Gallery & Arts Centre and developed during a two month residency at the Gallery from January 2014. 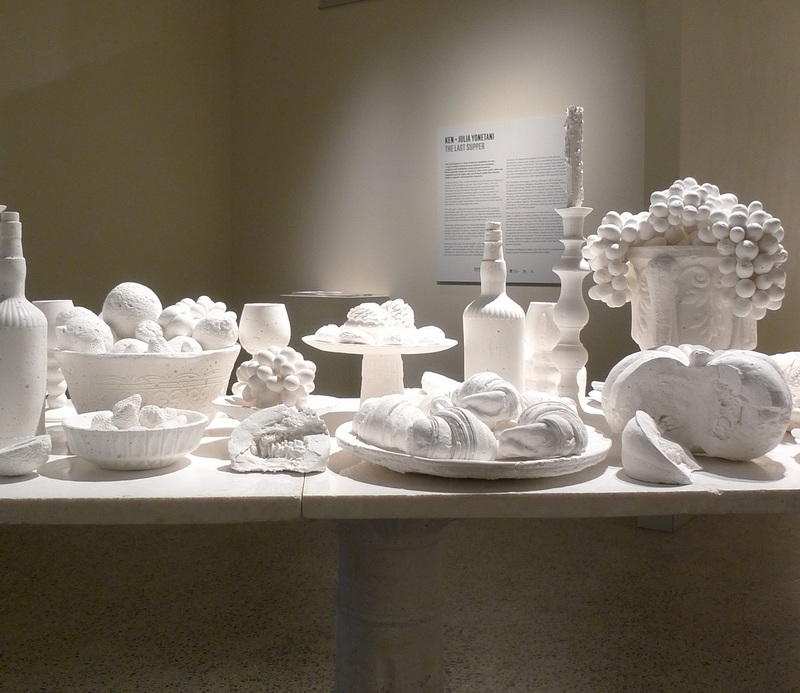 Following on from their prominent 2011 work, Still Life: The Food Bowl, The Last Supper addresses themes of food production, concerns arising from the level of salinity in Australia and related environmental impacts. Salinity has posed a major problem for civilisations throughout history, from ancient Mesopotamia over four thousand years ago to present-day Australia. Along the Murray-Darling basin, known as Australia’s ‘food bowl’ because it produces up to ninety per cent of Australia’s fresh food, 550,000 tonnes of salt is pumped out of the ground every year to try and stem the increasing rise of highly saline groundwater. The Last Supper is a large-scale sculpture made entirely from this groundwater salt, taking the form of a nine metre table laid with a variety of foodstuffs on top. The work draws on the still life genre as an artistic tradition that emerged as current agricultural practices were being developed, bringing new food produce to the tables of a rising European bourgeois class. The themes of consumption, luxury, vanity and mortality portrayed in these early paintings are re-enacted in this installation. Using salt as the single artwork medium brings focus to the environmental cost of agricultural production and connects with the historical associations of salt—as a powerful, sacred substance that maintains life by enabling food preservation, but also induces the death of ecosystems and the collapse of empires. Salt becomes a metaphor for the rise and fall of civilizations throughout history, and the issues of environmental decline, climate change, and food security that face us on a global scale today. A Hazelhurst Regional Gallery & Arts Centre commissioned project toured by Museums & Galleries of NSW.